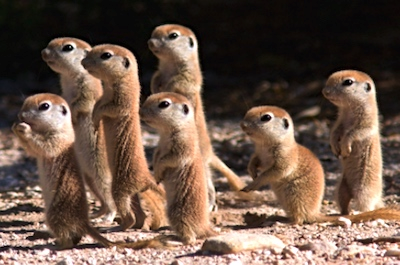 What do you mean, we "have to change"? In Part 1 of our Four Foundations, we discussed the challenges and opportunities facing enterprises which are not taking better advantage of outsourcing relationships to help plug their talent and capability shortcomings. However, while it's one thing to talk about the delights that await ambitious enterprises when they make definitive plans go down this path, it's another to assess whether they truly recognize the burning platform to take themselves through this period of pain and complexity to get there. Our brand new study that delves into the Ideals of As-a-Service (stay tuned for the full release very soon) reveals some startling home truths as to what's likely coming next. My biggest fear in our the industry is for those people just sitting around literally waiting for change, as opposed to squaring up to the commoditization and automation of legacy processes to provide their firms with new ideas, new ways of doing things and adding value, beyond simply keeping the operational lights on. Why is it that over half of senior managers view As-a-Service dynamics as critical, while only 29% of their teams under then feel the same? Answer - most people are comfortable with their daily grind - they stare at metrics on spreadsheets, ensure exceptions are handled and the corporate engine keeps running. They turn up at meetings and say all the right things, avoid challenging the status quo (while acknowledging there can always be improvement), but deep down have settled for adequacy and a steady treadmill drumbeat of efficiency without too many fireworks or drama. Why would they want to learn how to collect and interpret data more intelligently? Why would they want to find problems, as opposed to solving them when they crop up? Why would they want to mimic manual processes into scripts to have them run robotically, when they can patch over these inefficiencies with cheap offshore labor? Why would they want to explore the potential of artificial intelligence and self-learning computing capability when they can just do these things themselves (or at least pretend to do them). Answer - they have no burning platform to change the way their do their jobs. But there is one significant burning platform that will burn them, if they are not willing to adapt to the As-a-Service world: they will be irrlevent in tomorrow's corporation. Yes, they may be lucky and survive in legacy organizations that can get away without changing, or they may be in their late 50's and only care about lasting a few more years until retirement, but - for most - if they cannot adapt to As-a-Service, their bosses will shift them on and either replace them with a service provider staffer, or just simply phase out their legacy job, as it was not really needed anymore. It's true, in many cases, that service providers are not providing much more than basic operational offshore-centric delivery, however, that's usually because that is all these clients intended to receive, when they ventured into using external services to drive out cost - and the reason why they selected service providers to provide operational efficiency, as opposed to plugging critical capability gaps. 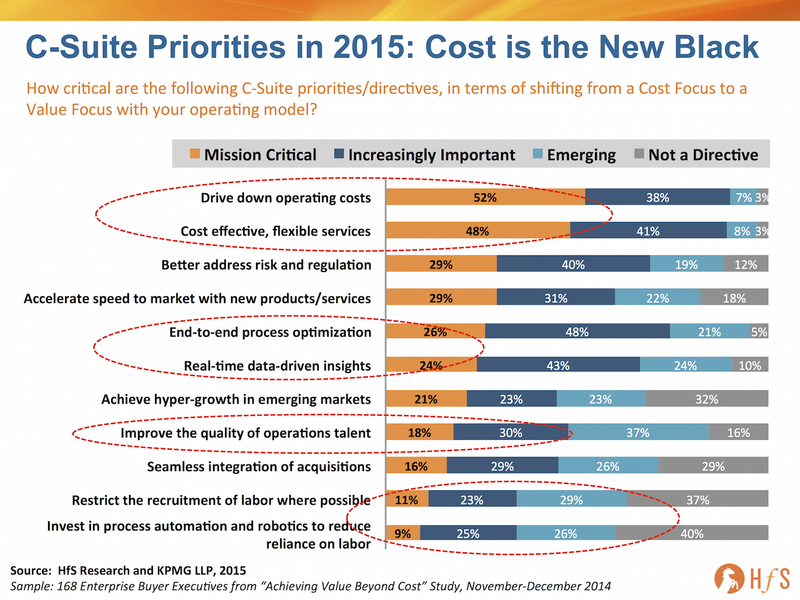 We all know the initial benefits behind outsourcing quickly become forgotten as the C-Suite turns to its operational leaders to demand continual productivity gains and value, however, the motivations from leadership are not changing, more the means by which to satisfy the C-Suite's insatiable thirst for running the enterprise as cost-effectively as possible. And this is the very essence of the As-a-Service Economy; finding new ways and means to run businesses as efficiently, intelligently and flexibly as possible. 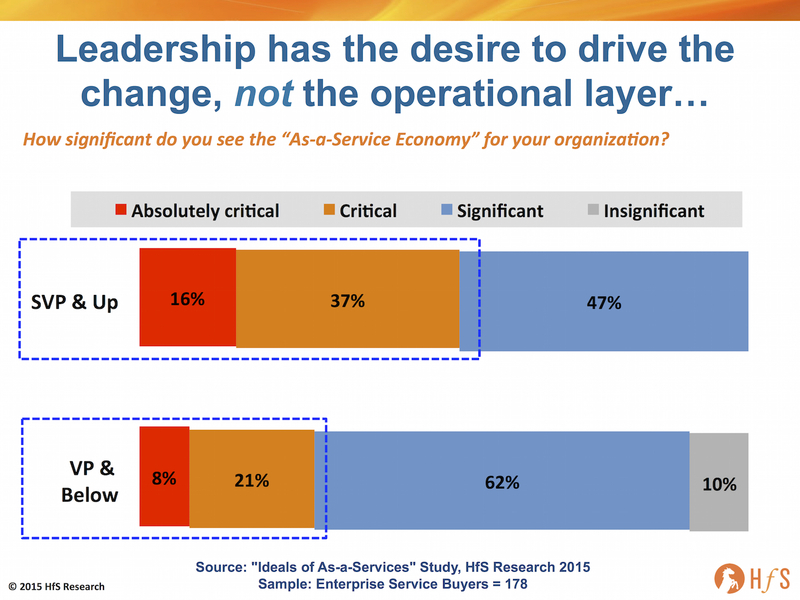 However, while a company's leadership is always biting at the heels of its operational leadership to keep driving out the cost, the resistance coming from the middle layers and down is clearly becoming a pressure point as enterprises realize they have to go through a more radical, painful period of transition as the As-a-Service Economy slowly becomes a reality. The good news for service providers, is a very small proportion today views them negatively as low cost body shops (this would have been a lot higher just a few short years ago), however, most are stuck in this middle ground, where their clients only want and - expect - a service designed to scale their operations and help them be more cost efficient. 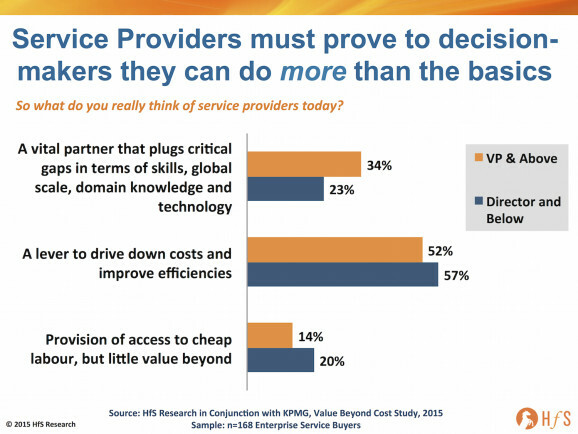 However, a third of the more senior managers (VPs and above) do view service providers as genuine capability partners - and that's actually pretty good, provided the right providers can figure out how to work more with these senior people to explore value-driven relationships. 2) Service buyers need to recognize this genuine burning platform to shift gears from Efficiency to Capability. I once heard somewhere that a core requirement from the leadership is “to be comfortable with ambiguity”. I guess few leaders have taken it too seriously and they are just comfortably waiting in their chairs for the inevitable to happen. Excellent piece, Phil. You capture the threat to our industry well - if people don't adapt that could very quickly get moved aside. 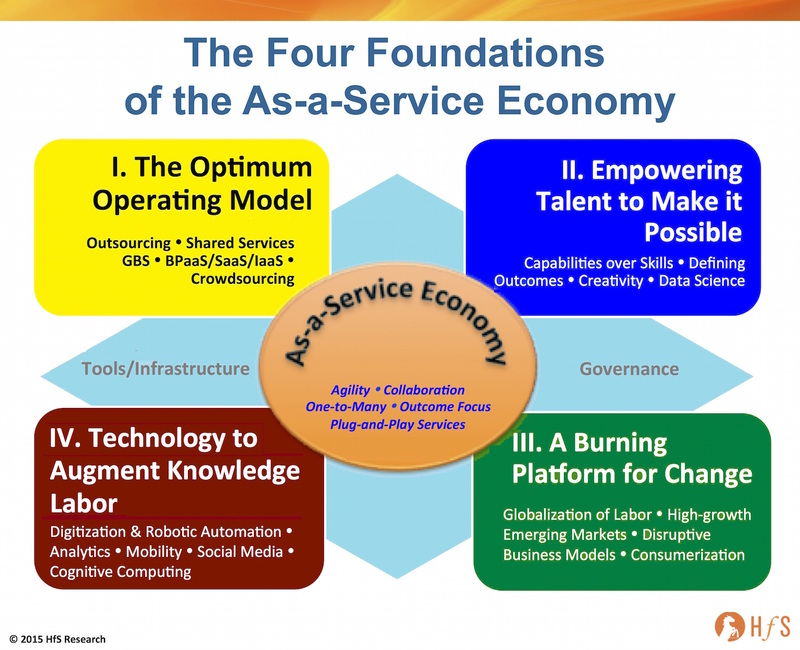 What do you see as the timeframe for As-a-Service to have a genuine impact? @Jim - You probably know in the past I have been positive about the impacts of automation, AI, standardization etc. However, the more buyer calls I do, the more it's glaringly apparent many of these people are simply not equipped today to make the shift (and our data points to this with a "kicking the can down the road" attitude - especially from the major enterprises, clearly happy to wallow in the old world). I think we need to be the brokers of the harsh truth that those who fail to step up and adapt are facing irrelevance - and this could happen sooner than we think. That is the "Burning Platform" to which I refer. 80% of outsourcing relationships fail to deliver collaborative value&#8230; so what can we do?